The crown jewel of Oregon is arguably the Deschutes River. Earning Federal Wild and Scenic designation in 1988 the Deschutes is managed for recreation and continues to gain in popularity. 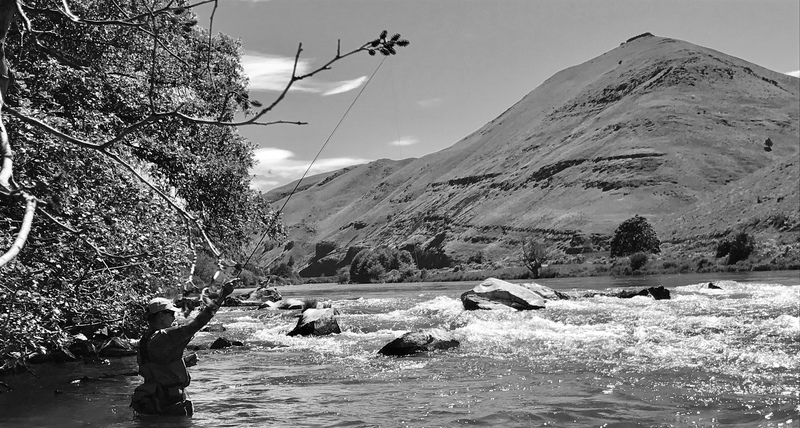 The tailwater fishery is 100 miles long and runs north through an arid desert canyon until it meets the mighty Columbia River east of the Dalles Oregon. Along with beautiful scenery and all sorts of wildlife viewing opportunities are the fish. Wild populations of “redsides” or rainbow trout, mountain whitefish, bull trout, summer steelhead, spring Chinook and fall Chinook make the Deschutes a top fishing destination in the spring and fall. The Deschutes is unique in a lot of ways, for one there is no fishing from a boat. I get asked a lot where this came from and I have lots of answers but one thing’s for sure the Deschutes is a varsity level field for bank anglers. Without a boat anglers will test their skill daily against a very sly opponent. River level, clarity and temperature are very complimentary to a strong trout fishery. Very few things will put the Deschutes out of shape and unfishable so it’s a fairly safe place to plan your next fishing get away. The insect activity is heavy but the big hatches are very reliable (more on this later). The Deschutes is truly an awesome river to fly fish with runs riffles and eddies all around. River access is impressive as well and there is something for every type of angler and adventurer. First non-native visitors to the Deschutes occurred in 1805 when Lewis and Clark crossed at the mouth. The name Deschutes means river of the falls for Celilo Falls located just downstream from the mouth. Celilo Falls was a major hub for native peoples until 1952 when the Dalles Dam submerged it. There are three dams on the Deschutes itself built from 1958 to 1964 and it is not without controversy today. From it’s confluence with the Columbia River a railroad runs most of the way up the Deschutes, on the west bank until it crosses the river at North Junction just short of river mile 75. On the east bank there is an old railroad grade running parallel much of this distance, today it is a road, a dilapitated trail, then a road again. There is a great book on the Deschutes Railroad Wars covering this period of time and is a great bring along book if you are floating the river. Humans have had interaction with the Deschutes for a long time, even though it’s a “wild and scenic river”, there is good public access. 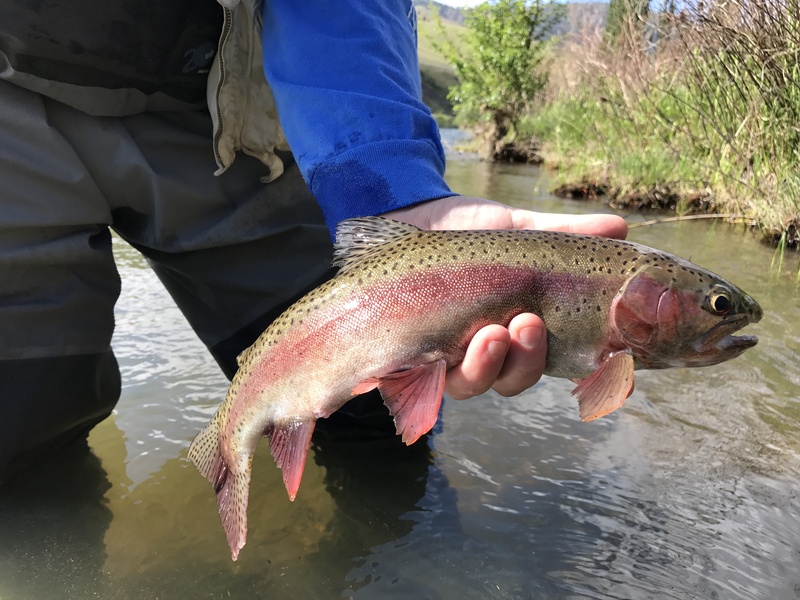 Prime time trout fishing starts in late April and runs into the summer but the best month is May and the Stonefly hatches. After the Stonefly hatches there are caddis and mayfly hatches well into summer. The stonefly hatch is often referred to as the “salmonfly” hatch, but really they’re not alone, both golden stone and the smaller yellow stones are going off at the same time. During this hatch it’s not uncommon to see blue winged olives, pale morning duns pale evening duns, caddis flies and once in a while the green drake hatch. 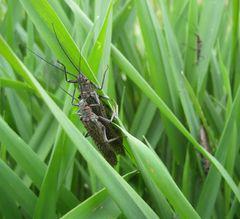 If you’ve got these bugs in your quiver then you are ready to come over and fish the Deschutes this spring. The Salmonfly hatch is easily the most explosive dry fly fishing of the year. These giant bugs live several years on the bottom of the river and then they make their way to the rocky shore, clumsily climb out and molt from their nymph stage to adult. The adults will congregate in the grass, bushes and trees until which time they breed then take flight. The big slow flying bugs drop their eggs into the river then the cycle begins again. In the middle of all this we have two or three weeks of great fishing, this trip is a bucket list. If you point at a hundred miles of river and all the access point on the BLM guide (buy one), you might not start in the right place. The “salmonfly hatch” moves up river with the water temperatures. Ground zero is Maupin Oregon, one of three places the road crosses the river, Maupin is right smack in the middle at river mile 52. From Maupin the road goes north for a few miles until it reaches Locked Gate and south where it crosses the river and eventually leads to the Lower Deschutes access road. Going North or south on this road gets the average guy plenty of spots to fish. Maupin is well appointed with a fly shop a store some restaurants and a hotel. The first time the road crosses the river is at the Warm Springs Indian Reservation boundary, river mile 95. There is river access on the east bank only. 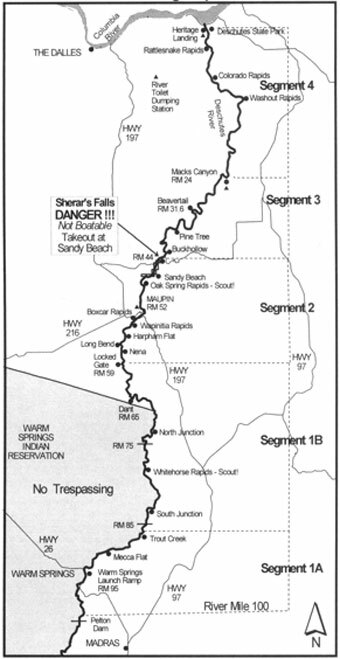 The west side is tribal lands and a tribal guide is needed to access it, there is a small exception from Dry Creek to Trout Creek and a tribal pass is required. Back to the east bank, the first public boat ramp is located on highway 26 on the east side just prior to the reservation boundary, it’s well marked and heavily used. The next access point is Mecca Flats, a popular improved campground with a lightly used boat ramp. A good trail runs north along the river to Trout Creek also an improved campground with a boat ramp. The float from Warm Springs to Trout Creek is referred to as the day stretch although camping is allowed in designated sights only. Camping from a boat on the lower Deschutes is regulated and requires a boater’s pass from The Bureau of Land Management; the BLM is the primary manager of the river along with Oregon State Parks, the Confederated Tribes of Warm Springs. If you buy a boaters pass there is a list of requirements to camp out of your boat one of them being a portable toilet. Once you get to Trout Creek, RM 85, the next public access is Maupin, RM52 give or take. The section from Trout Creek to Maupin is the multi-day section, this trip can be done as an overnight but is best done in two night. Multi-day float trips down the Deschutes are what the Deschutes is all about. The tribal side of the river remains off limits until the boundary is reached, usually on day two below North Junction around RM65, there’s a great big sign you can’t miss it. Look for wild horses near the reservation boundary. I would be remiss in my duties if I didn’t point out a few hazards on this section, Trout creek Rapids, Four Chutes and Buckskin Mary are all legitimate rapids where experienced boatmen should be on the oars. Whitehorse rapids should be attempted by very experienced boatmen. Whitehorse canyon is the most beautiful stretch on the Deschutes River but it claims several boats every year and people have lost their lives there. Most people camp two nights, maybe an extra night on the same spot and take out near Maupin at Harpham Flats. The Deschutes has a lot to offer every level of angler but if you are coming from afar or want to maximize your effort hiring a local guide or outfitter is well worth the money, trips range from $500 for single day to $400-$500 per day per angler on multi day trips. That said if you are just getting started and have the time for trial and error or you are a total do it yourselfer the Deschutes has your name written all over it. Rods – 5 or 6 weight rods with weight forward tapers, the more aggressive the better. Reels – Deschutes fish are big and strong and they can take all your line if you let them. Bring a reel you can palm, I like click and pawl reels with an exposed rim. A smooth disc drag large arbor reel is perfect most most anglers. Leaders: Tapered 2x, 3x, 4x, and 5x. Same thing for the tippet. I fish as heavy as possible on the big bugs; I also like a 7.5 foot leader but carry 9 footers as well. Some times accuracy in the wind and into the bushes is aided by a short leader. Gortex waders with felt and studded boots. Come prepared for sunshine and for rain. Bring lots of Salmonfly and Stonefly patterns, some Green Drakes, BWO’s, PMD’s, and PED’s. It’s not a bad idea to bring some nymphs of the same bugs just in case. deschutes river, deschutesjetboatguide, deschutestroutspey, dschutestroutguide, fly fishing report, salmon fly hatch. Bookmark.